The head of the European Union has rejected Greece's request for an emergency meeting aimed at ending an impasse over the country's bailout. EU Council President Donald Tusk said the group's finance ministers needed to resume talks themselves within days. Greece agreed to a third rescue package worth €86bn (£60bn; $94bn) last year and faces a looming debt payment. However, it has been unable to unlock the next loan instalment after clashing with its creditors over more reforms. The International Monetary Fund and other European partners are demanding that Greece implement further austerity measures. They are looking to generate nearly €4bn in additional savings or contingency money in case Greece misses future budget targets. But the left-wing government led by Alexis Tsipras has said it will not agree to any "additional actions" to what it had already signed up to last summer. A special ministerial meeting was supposed to be held on Thursday, but Dutch Finance Minister Jeroen Dijsselbloem, who is in charge of the Greece negotiations, called it off. 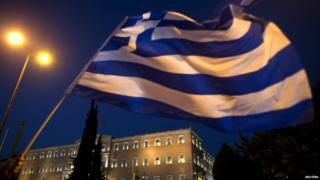 There are worries that Greece may default on €3.5bn in debt payments due in July if an agreement is not reached soon. Last summer, a crisis erupted after Athens defaulted on its debt payments and raised the spectre of an exit from the eurozone. But Athens has faced stiff resistance from voters to the austerity measures, which include politically charged changes to its pension and tax system. It is already looking to implement spending cuts that will amount to 3% of the country's gross domestic product or €5.4bn euros by 2018. Greek shares slumped by more than 4% during the trading day on fears of renewed economic uncertainty in the country.